This is the second part of my series looking at bad choices in the anime industry. The first part of the series focused on Localization of classic properties and the reasoning behind the localization failures such as The Vision of Escaflowne and Cardcaptor Sakura. This article will be focusing on a key part of any anime (or story for that matter) the ending. I’ve found oftentimes there is quite literally no better way to kill a story then with a bad ending hell I’ve been turned off franchises entirely due to a story having a particularly bad ending; a perfect example of this would be the ending to How I met your Mother. Luckily there are very few anime’s that have been that strong at times and that egregiously bad right at the end however as per the title of the series I do have a few examples one of which has marred what is otherwise one of my favorite anime and manga. Unlike the previous entry which was more akin to a narrative regarding the history of anime I’m going to switch things up and go back to one of my more classic formats and talk about specific type of anime endings as I see them. The first is often times the best the “true ending”, the second is the unfortunately common “not a ending” ending, the third is the “temporary ending”, and the fourth and final version is the dreaded anime original ending. This is about Endings. For most Anime discussed here there will be spoilers of some variety from this point. “The True Ending”: In terms of adaptations these are without any doubt the ending every anime should hope to achieve. This is the ending type where the anime ends as the author intended it to be finished in either the manga, light novel, or screenplay. Sadly these endings are actually quite rare mostly due to the fact only the most popular of anime every actually finish adapting the source material just due to various issues such as the amount of time, energy, and money it actually takes to fully adapt many manga and light novel series. That being said due to this being a focus on adaptations it of course leaves off the much more controversial True Endings from anime original fare. Some such controversial endings being Code Geass R2, Neon Genesis Evangellion/The End of Evangelion (and call me crazy I expect The Rebuild of Evangelion will also fit this), and The Vision of Escaflowne, among many many more. That being said with the obvious exceptions these endings are always the best endings even if the ending themselves are not that good (Shakugan no Shana). As they provide a sense of closure there is no lingering doubt you didn’t know how the series was supposed to end as the series did end just as it was intended to do. So providing some of what I consider the best true endings is just an exercise is subjective thought but I’ll do it anyways. One great True Ending was Full Metal Alchemist: Brotherhood not just because it was a good capstone to a great anime but because it fulfilled its promise. Being a remake FMA: B was always supposed to be the True Ending or continuing my gaming metaphor the “True Route” and therefore it having a satisfactory ending was always going to be key. Anyways this is as I said so subjective so I’ll leave it to you to think of your favorite adapted ending or better yet an anime you kinda wish got here. “Not an Ending” Ending: This type of ending is far more common then I would like and really only gets the term “Ending” because they come at a last episode produced. Without going into too much details this is where the anime ends without: the villain being defeated, the central mystery being solved, the driving goal being achieved, and so on. It’s those horrible endings that just hang without closure; to some they can be doorways into manga to others the anime just is forgotten. However there is nothing worse then something that just hang’s knowing its never to be finished. Oftentimes these types of endings occur when a long running anime loses popularity and is cancelled such as the fate to the first series of Inuyasha. It can also happen when an adaptation fails to meet expectations of the Production Committee, the rights holders, or a variety of factors this causes the show to be cancelled after a season or two. One such example of this is the CLAMP series Tsubasa based on the manga Tsubasa: Reservoir Chronicle which ended when CLAMP pulled the rights of the show from the production company Bee Train leaving the anime incomplete. To this day even with five very successful OVA’s the last arc remains unanimated and will almost assuredly stay that way due to its narrative and artistic complexity. Some more notorious examples of this would be the recently concluded Bleach. Despite having a perfect ending even if a bit melancholic following the defeat of the longtime Villain Aizen. Bleach continued into the widely panned “Full Bringer Arc” which restored the main hero’s powers to full strength including a rocking new outfit, indeed the entire purpose of the arc was to be a soft reboot for the series. However due to declining popularity Bleach was cancelled with the final arc of the series still left to be animated. Although I personally feel once the manga is finished we’ll see a “Final Act” for Bleach however at the moment Bleach remains the most visible and popular of these endings. The “Temporary” Ending: This form of ending is simple its a placeholder ending when an anime adaptation runs out of material to adapt and instead of becoming fodder for one my Filler Free Guides decides to end the series. The vast majority of late night animes fall into this category just due to the overwhelming popularity of one cour adaptations of Light Novels and Manga’s during these time slots due to financial and scheduling reasons. These animes tend to skew slightly older as monthly manga’s are a common source of these animes; the most notable recent example would of course be Attack on Titan. Many other animes fall into this almost every harem echhi style manga/anime except the most godly popular ones also the To Aru... meta-franchise adaptations fall into this due to the large amount of content to adapt and limited time (and budget) to do it. Other animes such as the recent Brynhildr in the Darkness kinda have this ending type as the story through the manga is continuing, however its not a perfect fit as its last episode left a good amount of closure (even if it had to butcher the pace of the story along the way to do it...). This is a good example of a trick many story makers knowing they may never finish adapting the source often utilize, by picking an event suitably epic such as the ending of a major arc or a huge fight they find some sort of closure leaving the viewers satisfied while simultaneously leaving the viewer open to continuing the story through the manga. Oftentimes this is not possible but when it is it’s universally more liked then a pure Not an Ending or Temporary Ending. The “Anime Original” Ending: To be honest this was the main reason I wrote this as my second part of “Adaptation Decay” series as I find there often is no worse sin an addaptation can do other then changing an ending. Even if it is used to create closure it’s always a false sense of leaving the viewer with the feeling something is wrong or out of place. This is even the case often when you don’t read the manga or Light Novels as the ending seems disjointed or otherwise unsettled. Really in the end anime original endings are terrible because there is always a linger sense that there is some ideal perfect ending out there somewhere and all you need to do is find it. Of course of the flip side this is an amazing way for people to get into manga; indeed it was the double whammy of filler and these endings that started my love affair with manga. Other then that I’m not really going to talk to much about anime original endings as really we all know them and why they are made as their is either no ending yet in the manga or there is too much content for the manga to get animated in the amount of episodes the show has left. Therefore instead of leaving the series open the show runners decide its better to close out the series and move on. 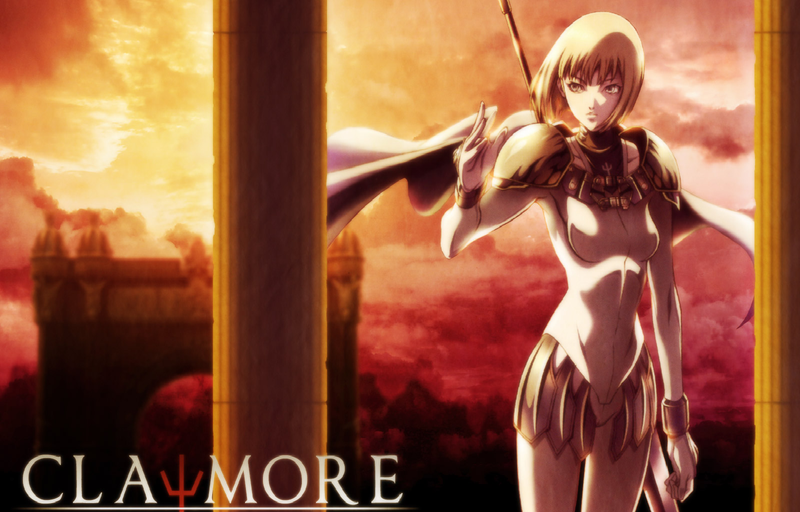 One such example of this and one of my more egregious examples would be the epic series Claymore which quite literally after a near perfect and faithful adaptation for its first 22 episodes had the last 2 episodes start veering off and needless to say ended in a very unsatisfactory note (there is a reason its the header image). The main villain was defeated yes but again how made no sense, furthermore threats that had been established previously which were almost equivalent to the big bad of the series were left at large and unaccounted for, and even central mysteries surrounding the main characters and their relationship with the organization were never solved. In short the ending gave us bad “closure” to one story while completely ignoring others. To this day I say Claymore would have been much better served by having a not an ending rather then what we got. Other examples include shows like Elfen Lied (Where the manga ending unsurprisingly was more messed up then the anime’s), Fruits Baskets, Ouran Highschool Host Club, and X (Clamp) (Ironically this is because the manga ITSELF had no ending yet...), and so many more. Anyways again I’d like to personally thank you for reading one of my long form writings on a topic that could be a little dry, however I myself have always found it more interesting to try to learn about the medium you love and I’d like to share that knowledge. My next one in this series is going to be Pacing and hopefully it wont be four months from now like this particular entry (I hit a massive writing block a couple months ago). Also if there is any topic of the anime business or issue you’d like me to cover I’d be more then happy to take suggestions as honestly some of the big stuff is starting to run low. Again hope you enjoyed it and please leave comments these are always better with a discussion.